From the 1st of December onwards, the Vespers will be celebrated every Tuesday and Thursday in the St. Augustine church. The vespers start at 16:00 and will take 30 minutes. The Vespers will be celebrated in Dutch except for the recessional hymn Salve Regina, which will be sung in Latin. The vespers are meant to find a quiet time with God at the end of the afternoon. During the Vespers there will be no collections. Our Faith starts with prayer and celebration. You can do this on your own or together with the community. The most well-known service is the celebration of the Eucharist. But there are also different kinds of services, among which the vespers. The vespers are the sunset evening prayers. It has been celebrated for centuries in convents and religious communities. When the day ends, it is a good time to thank God for all that he gave us. The celebration of the vespers have a fixed structure that builds on a long tradition: it starts with a hymn, followed by two short readings and sung psalms, the Magnificat en the Our Father. Why celebrate Vespers in the St. Augustine? 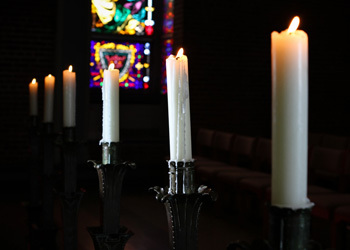 The St. Augustine is open every day of the week for people to light a candle, pray or attend mass. Celebrating the vespers adds to the community and gives the opportunity for a moment with God within the haste and stress of daily life. If you are interested in joining on a structured basis, you can register during the first three months, the registration list can be found on the table in the back of the church near the Maria chapel or you can contact the sevretary (tel. 030-2318545 or e-mail: info@salvatorparochie.nl). In the future we will evaluate and can make adaptations, such as maybe celebrate once a week in the evening, so that people that work can also join. To make this new initiative a success we would like to warmly welcome you to join us whenever you have time.